Nord Stream AG has finished a detailed report on the environment impact that the project may have. The report is to allay fears over the underwater gas pipeline from Russia to Germany and give it the green light. Russia, Germany, Sweden, Denmark and Finland were asked to allow the use of their territorial waters for the construction of the pipeline. The countries will have three months to study the report and voice their decision. The report comes a year behind the initial schedule. Denmark, Finland and Sweden have concerns over the project; in particular they believe the construction may disturb deposits of WWII chemical weapons in the Baltic Sea and cause a major disaster. At their request the Nord Stream operator agreed to change the route of the pipeline and not to use explosives during the work, reports Kommersant business daily. The report, which will be made public on Monday, cost the company more then 100 million euros. Kommersant managed to obtain a copy. The newspaper reported on Friday that the probability of the accidental release of poison is low along the route, despite it running near two known deposit regions. Sweden’s consent is likely to be the hardest to obtain. In February local media reported that an investigation had been launched into alleged bribery involving Nord Stream, which commented that it hadn’t received any official notification of the alleged incident, but that it was ready ‘provide thorough support’ for any probe. 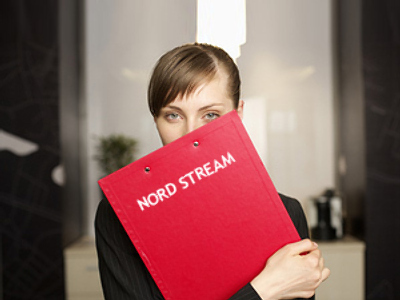 Credit crunch to block Nord Stream? Some experts say Nord Stream may have trouble financing the pipeline project due to the global financial crisis and high credit interest. In 2009 alone, it will need about 1 billion euros of investment, reports Vremya Novostei newspaper. According to Nord Stream’s financial director, Paul Corcoran, the pipeline’s first individual line, which is expected to be launched in two years, will cost 1.5 billion euros. Thirty per cent of the sum will be provided by shareholders, Russia’s Gazprom, Germany’s BASF/Wintershall and E.on Ruhrgas and the Dutch company Gasunie. The rest is to be borrowed on the credit market. However, affordable long-term credits are becoming a rare species today and shareholders are preparing to cover the deficit in the worse-case scenario, says the newspaper. Nord Stream officials have declined to comment on this information. The project may also welcome new participants. The French company GDF Suez is now in talk to join in as a minor shareholder. Nord Stream gas pipeline is an international 7.5-billion euro project. The 1220-kilometre pipeline will connect Russia and Germany along the seabed of the Baltic Sea. It will deliver gas extracted from one of the world’s largest fields, the Shtokman field in the Barents Sea. Once the first line is launched, it will deliver 27.5 billion cubic metres of fuel to Europe annually, with the volume increasing to 55 billion cubic metres a year by 2014. The project has seen a lot of criticism in various countries, including the Baltic States, Poland, Sweden and Finland, and from some international organisations. The project was called risky in terms of its possible effects on the marine ecosystems during and after construction. It’s also been called economically unfeasible and politically motivated, although Nord Stream officials claim otherwise. Some experts have suggested the pipeline may infringe European security, namely in being used for spying or as a pretext for the increased military presence of the Russian Navy in the area. Supporters of the project point out that its most vocal critics are the traditional transit countries of Russian energy to Europe, who would benefit from hosting a land-based alternative to the project. The pipeline is also intended to provide more security to European consumers, since it eliminates the risk of a cut or a shortage caused by a row with a transit country, as was the case during the gas dispute with Ukraine in January 2009.